By the time our plane landed in Marrakech, Morocco, we had been awake for much longer than 24 hours. 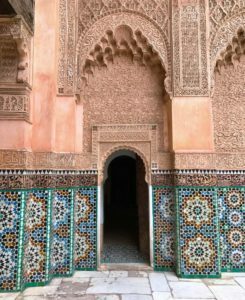 It was surreal at first; Morocco had been hovering toward the top of my travel list for quite a while, although it always seemed to wind up shuffled behind another destination. Earlier this year, over coffee and pasteis de Belem in Lisbon, I lamented how we managed to get so, so close to Morocco, but yet we just couldn’t manage to cross that border. No worries, Adam told me. Maybe when we plan a trip to Gibraltar we could take the ferry to Tangier. We’ll get there. As luck would have it, just a few weeks later we decided on a whim to attend that last day of DC’s Travel and Adventure Show, and we connected with a few companies who offered dedicated travel services to Morocco. 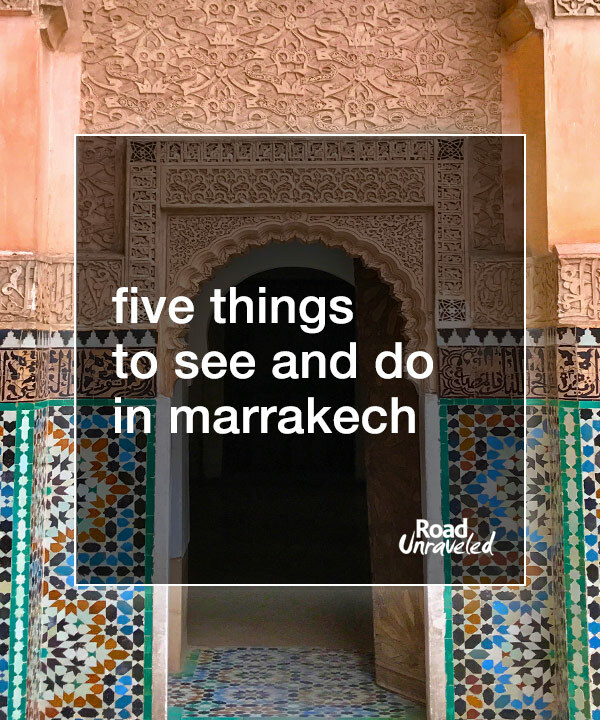 We had started toying with the idea of traveling to Marrakech for just a few days to see an ATP World Tour tennis tournament, but I wanted to find a way to see some sand dunes while we were there. It wasn’t long before we completely cast aside a quick excursion in favor of a more extended trip; it became evident that Morocco was too exciting and too diverse to possibly cram it into a long weekend. 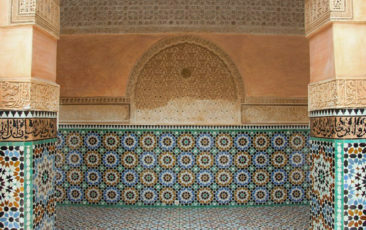 Ultimately we befriended the fantastic owners of DC-based Morocco Immersion Tours and Adventures, and they crafted a customized itinerary for us to live out my Moroccan dream— busy Marrakech, the sunny Sahara, historic Kasbahs, and the winding roads of the High Atlas Mountains over six days. 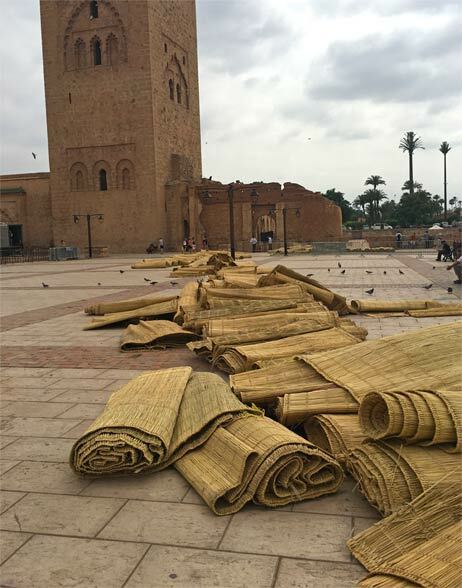 Less than three hours after our plane touched down, we traded the surrealness of just being in Marrakech for the surrealness of standing amidst a city so different than any other we had visited. 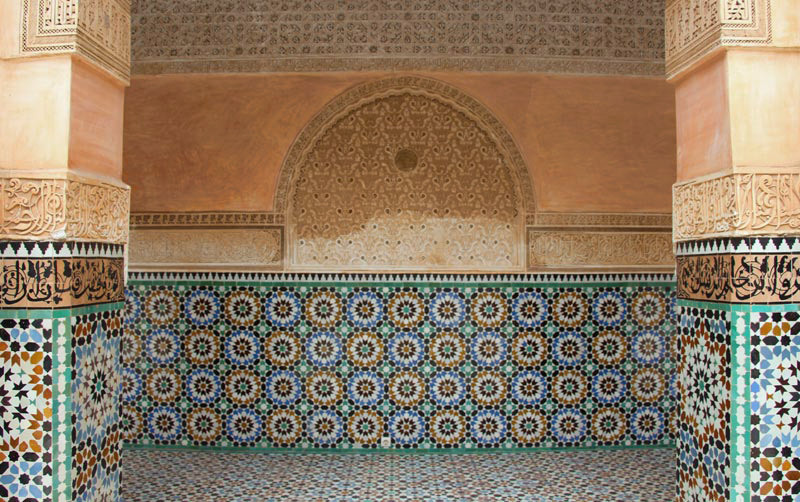 Our stay in Marrakech was short— most of our trip was spent outside of the city— but the brevity of our time there helped us to quickly identify a few spots every visitor must see. 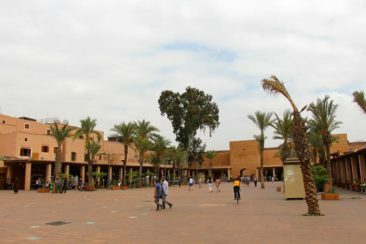 If you are planning to spend any amount of time in Marrakech, here are some places you just can’t miss. 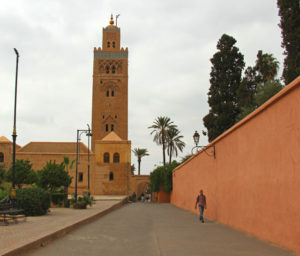 Chances are any visit to Marrakech will mean a visit to its famous medina. 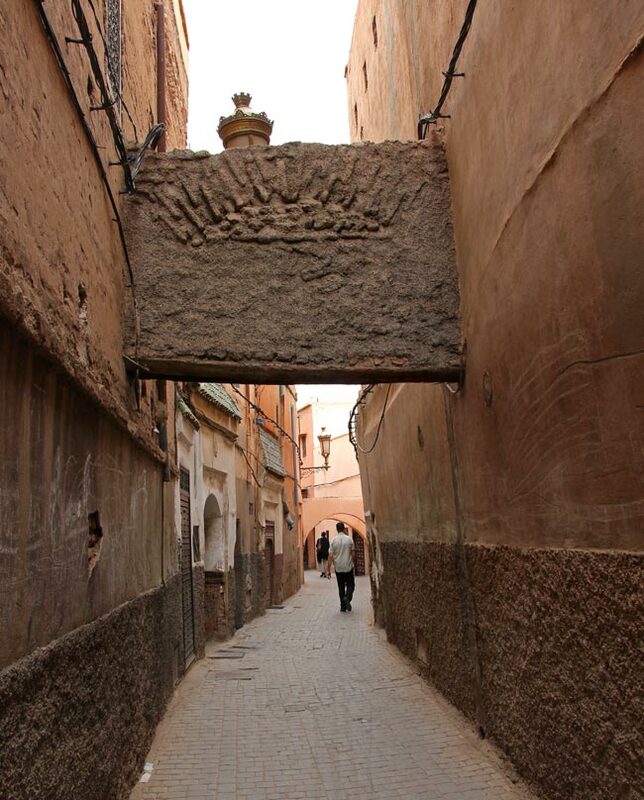 The medina, or the old section of the city, is still the heart and soul of Marrakech. 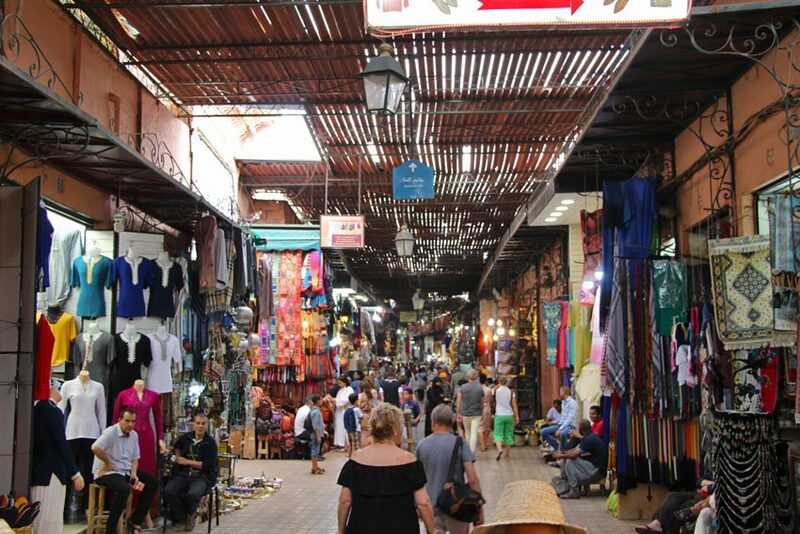 Surrounded by tall, dusty orange walls that date back to the 12th century, the medina is where delicious food, great shopping, incredible sightseeing, and plenty of people watching create the ultimate tourist experience. 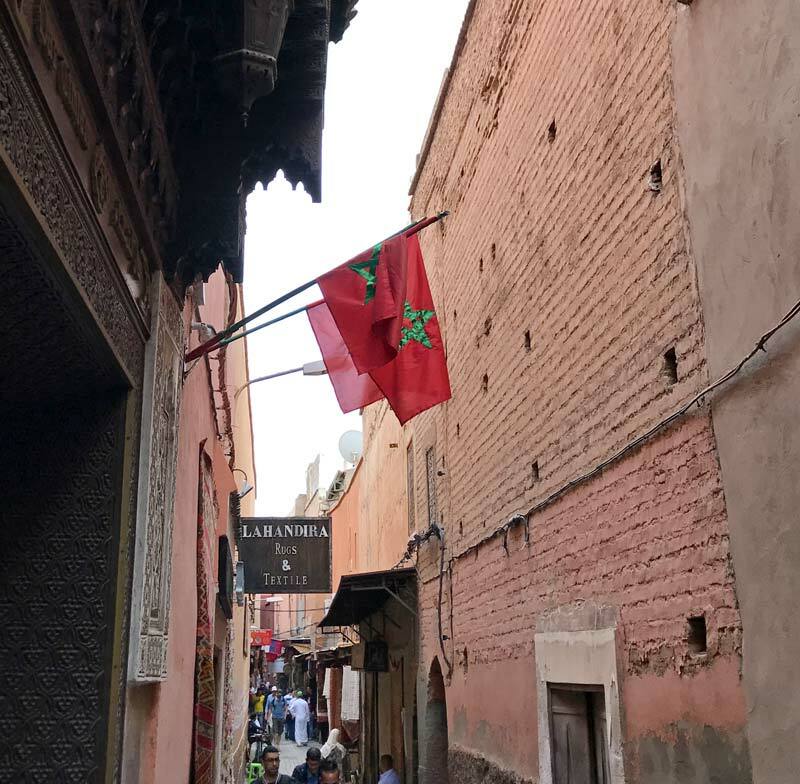 It’s an almost overwhelming cultural experience; the medina is nothing if not loud and colorful, and with its maze of winding streets and alleys it can be easy to get lost— either a good thing or a bad thing depending on your perspective. You won’t just dodge fellow pedestrians in the medina as you navigate through the city, though. We found ourselves constantly scurrying out of the paths of motorbikes that wanted a spot on the road just as much as we did! We found the medina easiest to navigate when we used landmarks to guide our path, and we benefited from following an experienced city guide during our first pass through the crowds. 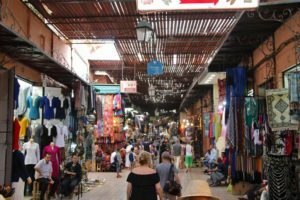 Many of the best attractions are found within the medina, and it is so big and diverse you may find it’s the only place in Marrakech you visit in depth. You won’t be disappointed if that’s the case; there is enough to do, see, taste, and experience that you might not miss anything beyond the historic walls. Wherever you are in Marrakech’s bustling medina, look up; you’ll likely be able to see the Koutoubia Mosque, the largest mosque in the city. 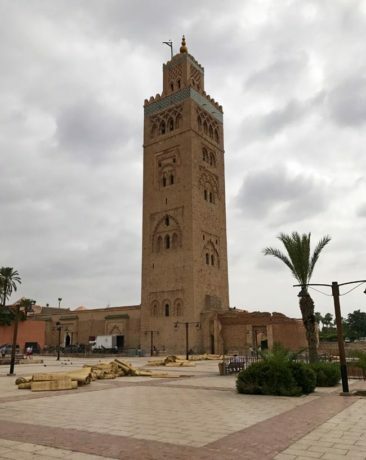 Built toward the end of the 12th century, the mosque’s minaret stands 277 feet high and serves as a great directional point if a visitor were to get disoriented. Originally, two mosques stood in its location; the first mosque was already under construction when its builders realized it was misaligned. 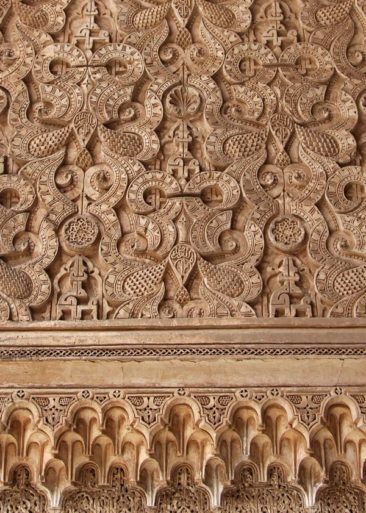 The mosque was five degrees out of alignment with the direction of Mecca, which meant anyone praying within its walls would have to adjust their position. Although that’s a fairly easy thing to do, the builders decided to correct their mistake not by tearing down the original mosque to start again but by building a second mosque in the same space. However, the second mosque also suffered from misalignment with Mecca— this time by ten degrees— so in the end both mosques had similar faults but remained in place. The first mosque fell into disrepair over time, but the second mosque remains in tact. Only Muslims are permitted to visit the mosque’s interior, so we observed it from the outside, but there was plenty to take in even without walking inside. Of particular interest to us was the enormous number of mats strategically piled around the grounds. Our visit was timed with the first night of Ramadan, which meant mere hours after our visit thousands of people arrived to pray as the sun set and their first day of fasting came to an end. 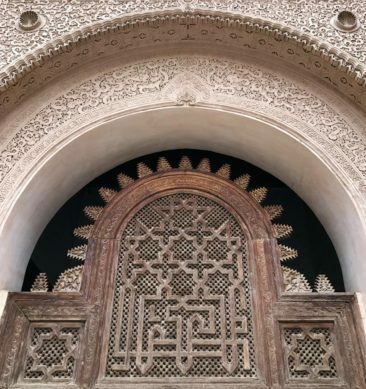 When it comes to Marrakech, you can’t miss the Ben Youssef Madrasa, a 14th century Islamic college that is also the largest of its kind in the country. 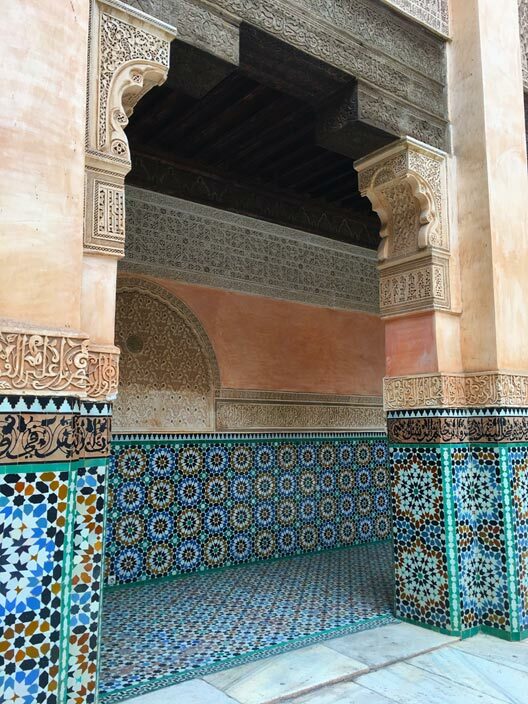 The madrasa is situated around a big, airy courtyard featuring beautiful stucco and tile work, all of which depicts various types of Islamic calligraphy and geometric patterns. Staircases lead to a second level that features sleeping rooms and study areas; typically, four students would share a room while studying at the madrasa. 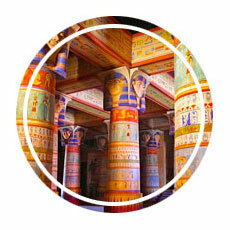 Because of its historical significance it is a popular tourist stop, so the building can get very crowded. 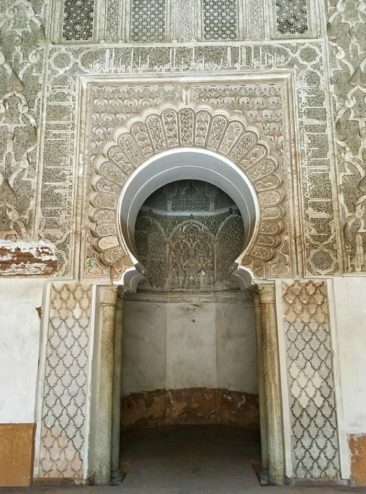 We visited toward the end of the day and enjoyed much lighter crowds, which meant we had plenty of elbow room and the flexibility to move throughout the madrasa at our own pace. 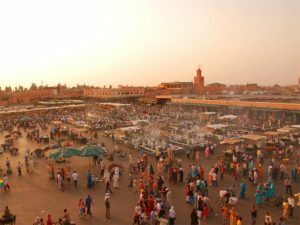 Jemaa el-Fnaa is one of the most famous and historic city squares in the world, and it’s well worth a walk through to pass the locals, vendors, and even snake charmers who set up there as day turns to night. During the day Jemaa el-Fnaa is populated but quiet; we saw a handful of vendors selling juice to thirsty tourists, and we passed a variety of snake handlers and, inexplicably, a man who was feeding a guinea pig and a chicken while encouraging passerby to take a picture. (We did not; it’s customary to offer a few dirham if you take a photo of people on the street, and we didn’t have change at that point.) In the hours before sunset more vendors set up shop; especially because it was Ramadan we saw a lot of people selling the traditional ingredients locals would use to make their Iftar meal when they broke their fast later in the day. By nighttime the atmosphere is much busier; there is music, food, and plenty of people with goods to sell. Visit Jemaa el-Fnaa during a few different times of day to get the complete experience and to compare and contrast the atmosphere when it is quieter versus when it is livelier. 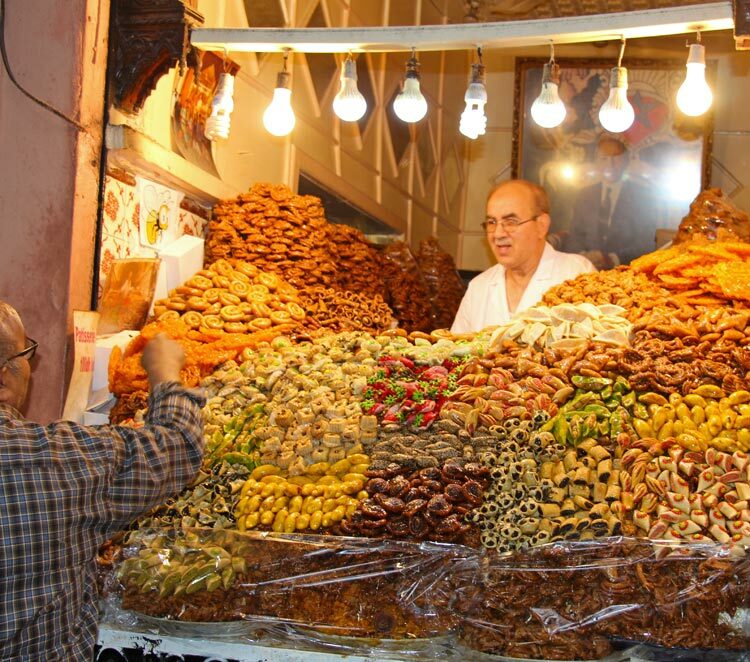 Whatever you might want to buy in Marrakech, you’ll find it in the souks. Souks are marketplaces, and they wind through alleys as part of an intricate maze throughout the city. We were amazed at the diversity of products we saw: beautiful hand-woven carpets, spices, slippers, fabrics, ceramics, and standard souvenirs like magnets and figurines. Because of their structure, the souks can be confusing to navigate, and many people have found themselves thoroughly lost during their visit. If you have the time, getting lost isn’t a bad idea. You’re guaranteed to find stalls or shops with great items for sale, and you’ll likely wind up with a few great purchases to commemorate your visit. 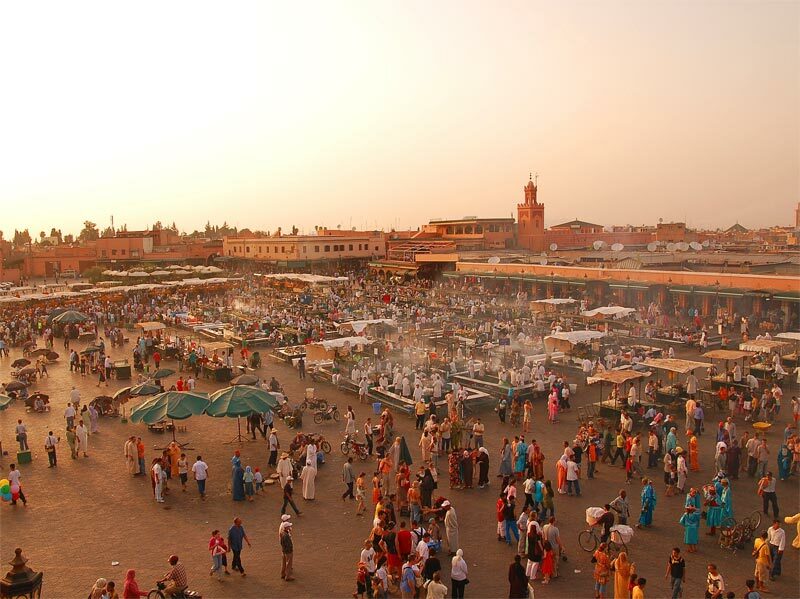 Thinking of adding Marrakech to your travels? Here are five tips we learned that might make your visit even more enjoyable! 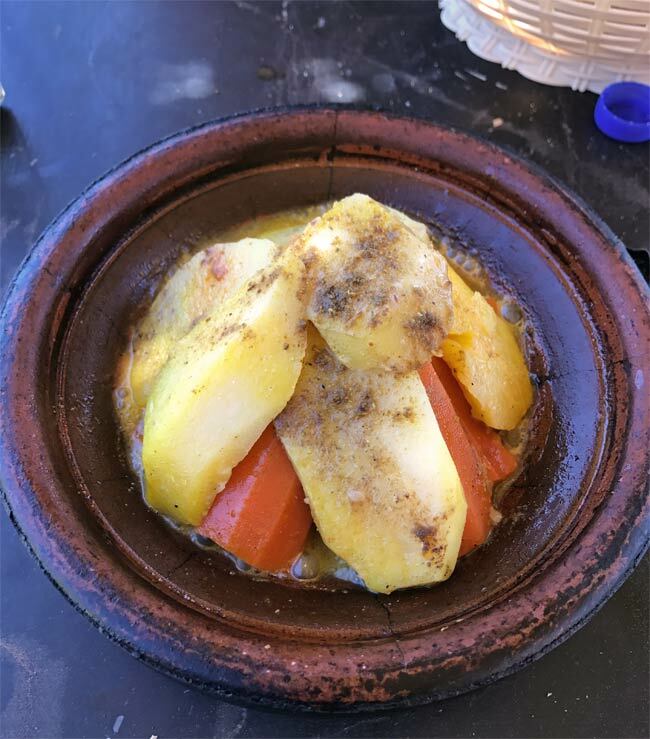 Tagine refers to both a type of cooking and the pot in which the meal is cooked. Typically featuring chicken, vegetables, beef, or a combination, the ingredients cook for hours in Moroccan spices before they are served. It’s a very common dish on most menus, and it will undoubtedly be one of the first foods you try. Couscous is on menus around the world, and you’ll see it everywhere in Marrakech. 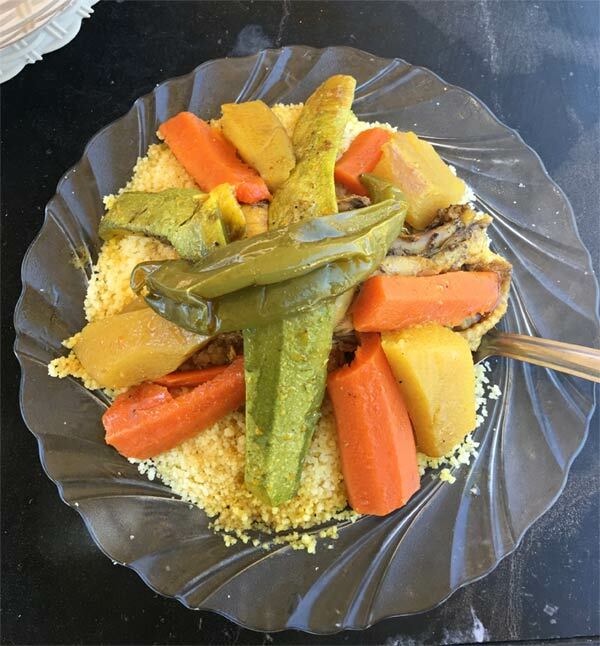 Typically served with a protein and veggies, Couscous is tasty and filling and very traditional. Harira is a typical soup made from tomatoes, lentils, chickpeas, and spices; it’s served throughout the city and is especially common during Ramadan, as it is among the foods served to break the fast. Chebakia are a very common dessert. 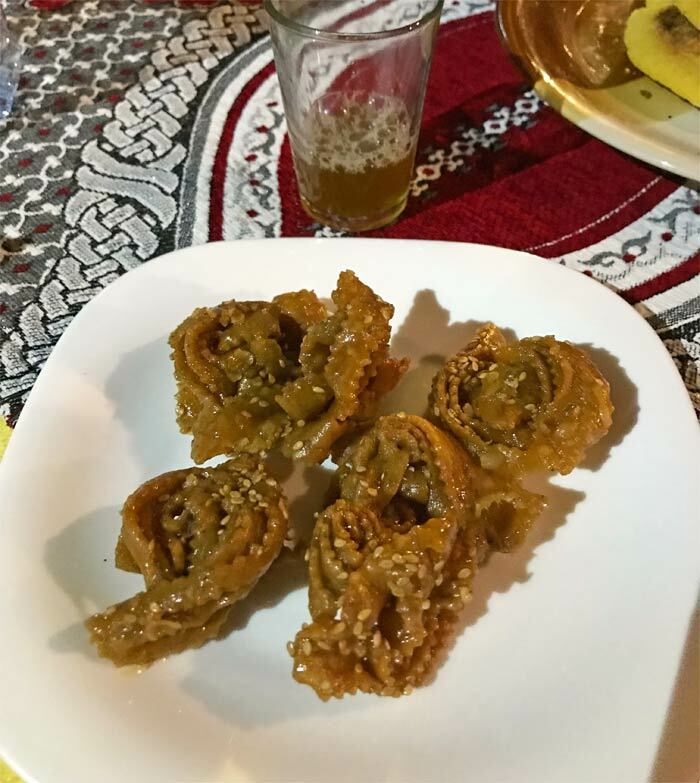 Shaped like roses, chebakia are deep-fried strips of dough that are soaked in a syrup made from honey and sprinkled with sesame seeds before being served. They have a texture similar to a cookie. Mint tea is served just about everywhere; you’ll be offered a cup by everyone from the people who want to sell you carpets to the staff at the riads. Mint tea is simple; it’s black tea leaves steeped with fresh Moroccan mint. Pay close attention when it’s served, though. It is customary to hold the kettle as high in the air as possible, which makes serving tea a bit of a performance in itself! As with any crowded area, keep a close eye on your belongings and know who is around you as you move through the city. Countless locals approached us and tried to wrap snakes around our necks (hoping we would take a picture—and then pay for it), and numerous women tried to grab my arms to offer “free” henna art. If you aren’t interested in what is being offered, a polite but firm “no” is most often understood and respected. In a few isolated cases, where a vendor was persistent, I found it effective to repeat the word “no” and simply move to a new spot. Remember that nothing is really free—the henna artist will expect compensation, the snake handler will want money in exchange for the photo opportunity he creates for you, and any gift or souvenir offered for free will ultimately be rescinded if you don’t offer some form of payment in return. You’ll encounter many of these situations in the medina, just as you will in almost every city around the world, so being prepared and knowing what—if any—services you will entertain will make your visit much more relaxed and enjoyable! 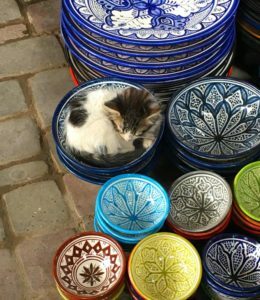 Unlike South America, where we’ve befriended plenty of stray dogs, cats are common throughout Marrakech (and, really, all of Morocco). We saw them everywhere; they slept in alleys, they approached us at dinner, and they sprinted out of nowhere to curl up for a quick nap in ceramic bowls in the souks. In Islam, cats are revered for their cleanliness, so most of the locals don’t mind them and even care for them to some extent. We witnessed plenty of people feeding them, petting them, and playing with them. Not all cats are safe and healthy, though, so take caution if they approach you. Also, if you have allergies to cats (as we do), consider packing some extra allergy medicine in case you need it. We were just fine without it, but it’s better to be safe than sorry! 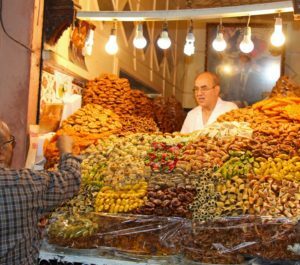 Bargaining in the souks is common—even expected—so you’ll have lots of chances to practice the art of making a deal. There are dozens of strategies you can employ to get the price you want, but it’s important to keep a few things in mind. Don’t accept the first price you are given. Shopkeepers expect you to counter their initial offer, so don’t be shy about proposing less than the first price you hear. Rudeness won’t get you far; insulting the shopkeeper’s merchandise—or, worse, the shopkeeper himself—will not result in a lower price or a good deal. Shopkeepers are proud of the items they sell; many of them hand make their goods, so avoid making disparaging remarks about quality in an effort to secure a lower price. Don’t offer to buy something if you aren’t serious. It’s not worth wasting your time or the shopkeeper’s time. If you aren’t interested, simply walk away. Remember that relationships are important, so consider developing a relationship with the shopkeeper as part of the bargaining process. You don’t need to become lifelong friends, but remember that the final deal should make the shopkeeper feel as good about the sale as you do. I negotiated a great deal for a wooden camel and told the man who sold it to me how excited I was to display it in my home, and he beamed as he carefully wrapped it for me so it wouldn’t break in my luggage. Kindness, genuine appreciation for the product you are buying, and care for the person who is selling it to you will make for a better experience for everyone. As we prepared for our trip to Marrakech—and Morocco overall—we had plenty of questions about what clothing would be appropriate. Men have it a bit easier; Adam was comfortable in long pants and lightweight shirts, and many of the locals and other travelers seemed to choose a similar clothing style. When it comes to women’s clothing, though, the lines are a bit blurrier. Islam is by far the most popular religion in Morocco, and while we found most people’s attitudes to be quite open and liberal, that didn’t change the fact I was most comfortable covering my knees and shoulders while we were out and about. Can women wear tank tops and shorts? Sure; but if you do, know you may become the center of unwanted attention. Many of the local women I encountered wore traditional clothing including hijab and niqab, and those who did not wore long pants and t-shirts. I wore long, loose-fitting pants and t-shirts most days, and I was comfortable in both the hot weather and the sense that my style of dress was appropriate for the location. 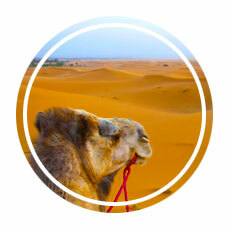 Are you ready to find a place to stay in Marrakech? Here are some deals to consider. Marrakech is an incredible place. The history, the culture, the food, and the shopping combine to create a truly unique experience. 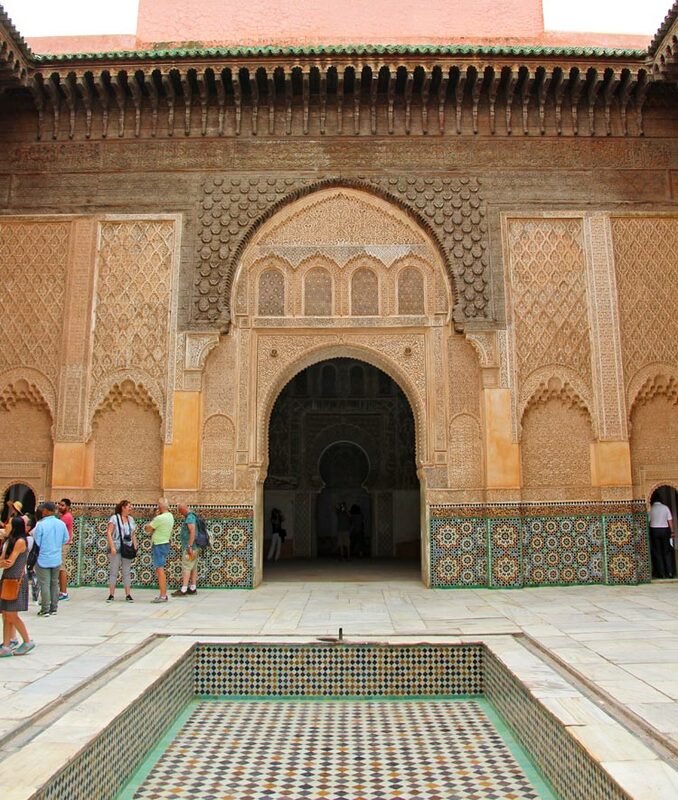 We wished we could have spent longer exploring the city—but we had much more of Morocco to see as our trip unfolded! Planning a trip to Marrakech? 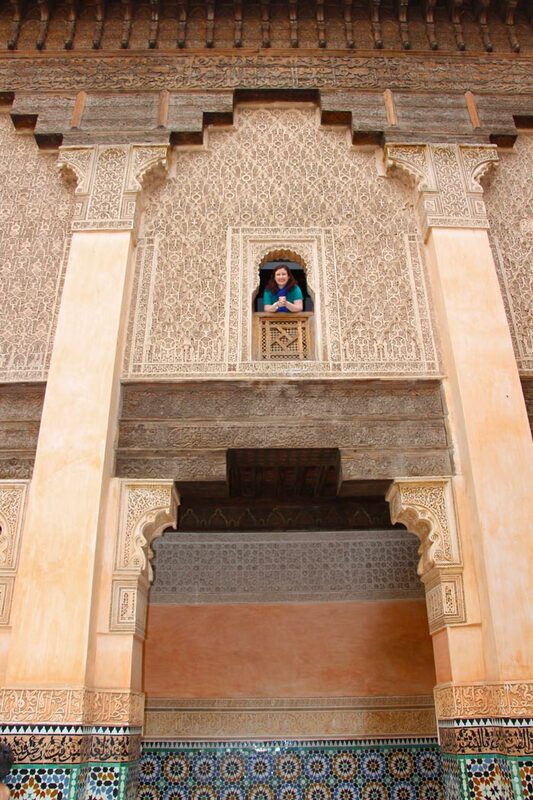 Here are a few more posts to inspire your travel throughout Morocco! * From time to time, our travels are directly impacted by a service or company. 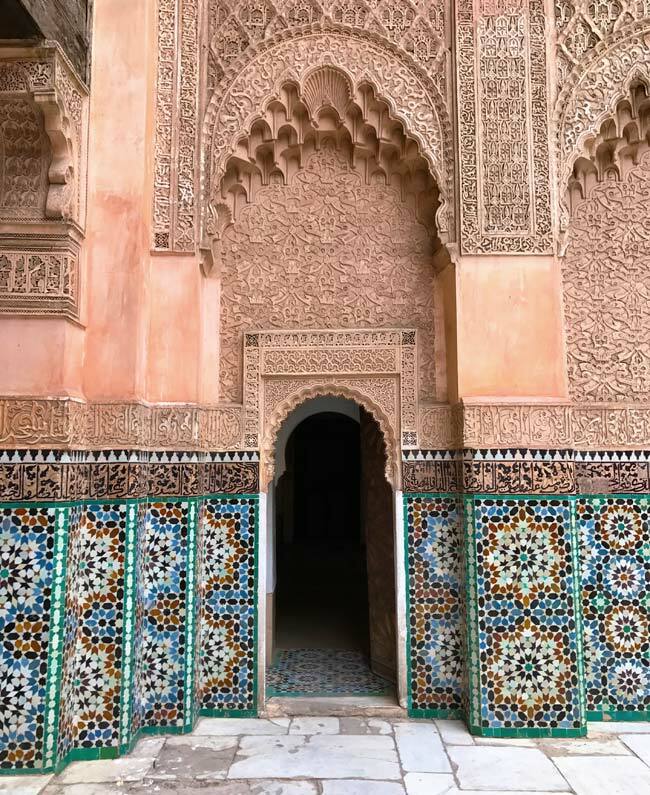 In this case, we booked a multi-day tour with Morocco Immersion Tours & Adventures, and this post includes our candid review of our experience. We selected Morocco Immersion Tours & Adventures independently and based on our own research and travel needs. 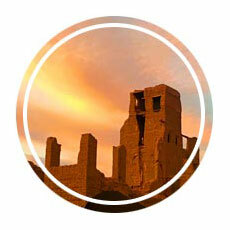 We received discounted pricing for our tour as a result of booking it after the DC Travel and Adventure Show. We were not offered and did not receive compensation of any kind from them or any other party in exchange for our review.